In a 400 V three-phase AC power network the maximum usable charging power is limited to 22 kW (32 A) or 43 kW (63 A) due to the necessary mains fuses, among other things. Charging with direct current (DC) at special charging points is therefore favoured for the fast charging of powerful vehicle batteries. 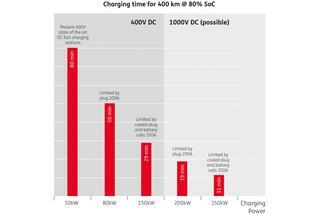 Today, battery packs with voltages of around 400 V are usually charged at fast DC charging points. The typical charging power is a maximum of 50 kW, so it takes about 80 minutes to charge a battery for a travel distance of 400 km (Fig. 1). As the charge plugs currently offer a maximum continuous charge current of 200 A, the charging power possible with the present-day 400 V systems is at most 80 kW. At the present time, it is therefore hard to improve on a charge time of 50 minutes for a travel distance of 400 km. The objective of charging an electric vehicle just like “filling up” a traditional car is of crucial importance to the development of the entire infrastructure in the field of e-mobility. 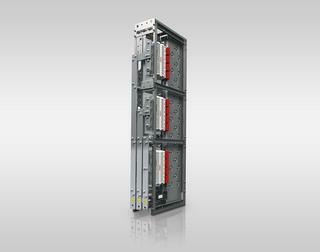 Therefore, an increased voltage of 800–1000V is already being pursued to quickly deliver the same amount of power with the same current. 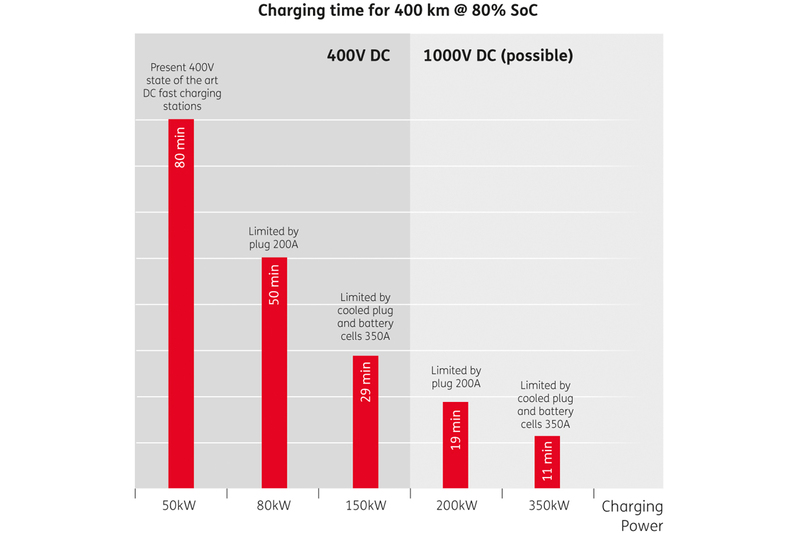 From today's perspective, an increased charge current of 350A will be possible with future battery technology using liquid-cooled charge plugs. 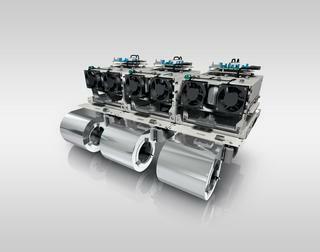 This means that an operating range of 400 km could be achieved with a charge voltage of 1000 V within about 11 minutes. Future fast charging points must offer charging power levels of up to 350 kW and guarantee the charging of vehicle batteries with differing battery voltages and capacities. 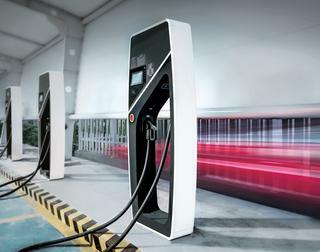 Powerful multipoint charging stations for long-haul electric traffic with several charging points will require their own medium voltage connection. 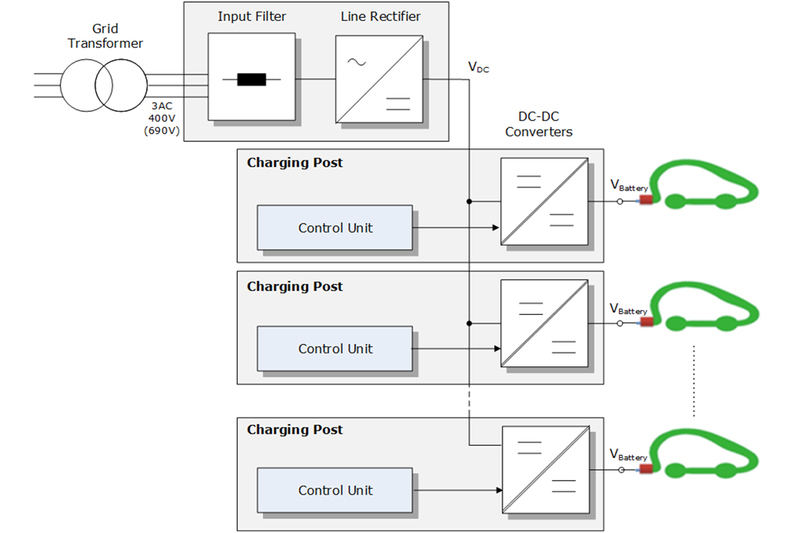 In contrast to AC charging stations, which are connected to the vehicle for many hours, DC charging stations do not need to provide regenerative feed-in capability out of the vehicle's battery into the energy network (V2G function). Current flows only from the supply network to the vehicle battery. 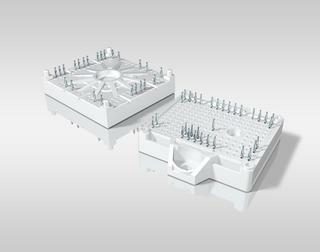 For a high degree of network friendliness, peak load management, and ride-through capability during brief power losses, these charging stations can optionally offer the integration of battery banks and solar power plants. If these also have to contribute to support of the supply network, the charging station must be equipped with a negative feed capable AFE (Active Front End) mains rectifier. 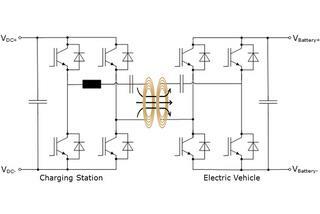 The most widespread topology for charging stations with multiple DC charging points comprises a central plant section with a 50 Hz transformer, an input filter for the reduction of harmonics and reactive power compensation, and the network-side rectifier. 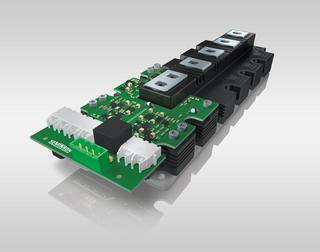 Each charging point also includes a vehicle-side DC-DC converter for adaptation and control of the charging parameters. 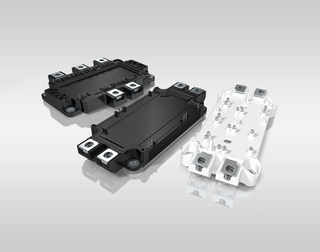 If individual charging points have to be independently connected to the energy network then the mains transformer, input filter, and mains rectifier must also be integrated into the charging point. 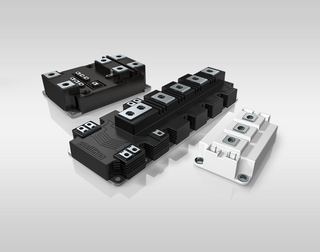 To minimize phase effects on the system, the mains rectifier can also be configured as an IGBT-based AFE rectifier without energy recovery from optional energy storage units. 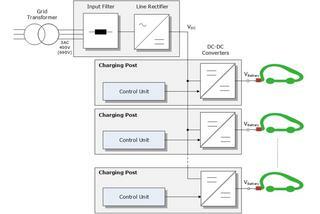 As this functions as a step-up converter, only step-down converters are required in the charging points, even if high battery voltages have to be generated from low input voltages. To minimize the isolation cost in the vehicles, the charging voltage must be galvanically isolated from the supply voltage. In charging points with their own mains connection, this can be done with the mains transformer as shown in Fig. 2. 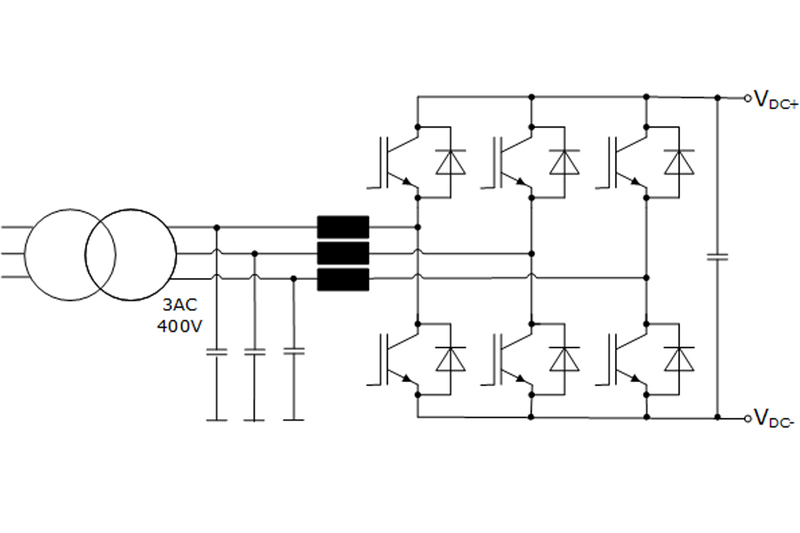 Alternatively, galvanic isolation inside the DC-DC converter provides the advantage that very small transformers can be used due to the high switching frequencies. 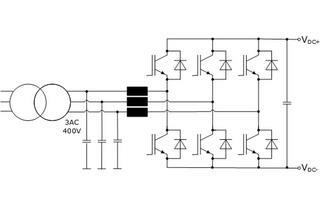 This is essential in the case of charging points in a charging station with a central rectifier. 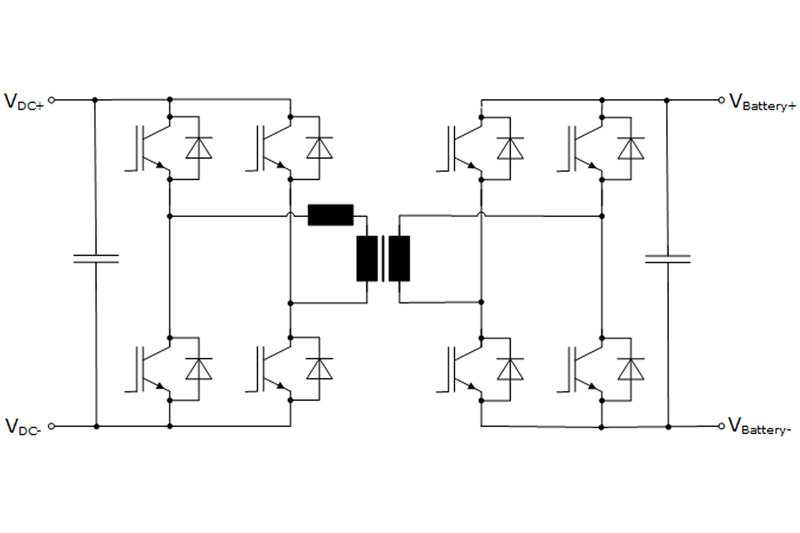 Another advantage of a high switching frequency in the DC-DC converter is the decreased smoothing requirement for the battery-side output for an increasing switching frequency. The charging process can also be performed wirelessly by means of inductive power transmission using an air gap between two opposing resonant circuits in resonant mode. The primary winding is located in the floor panel and the secondary winding on the underside of the vehicle. 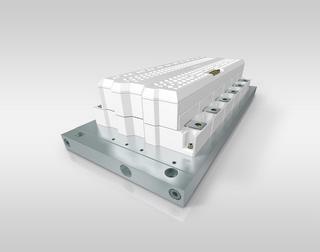 As the air gap can be 150 mm or more, the power transmission takes place at frequencies of between 10 and over 100 kHz. 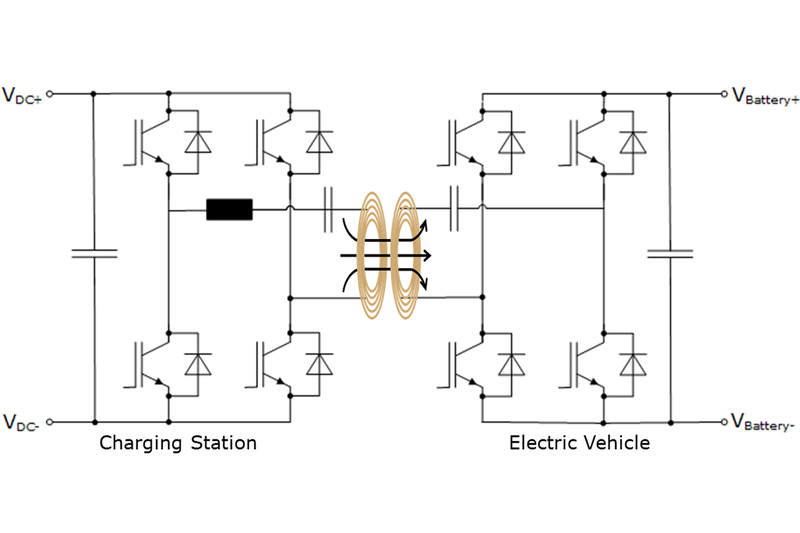 A possible topology for power transmission is one high frequency H-bridge in the charging station and one in the vehicle. 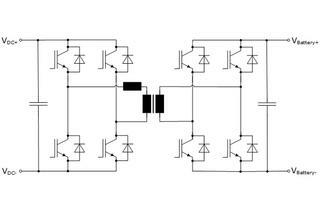 If the primary and secondary coils are close enough, the two H-bridges operate in resonant mode. The transmittable power and efficiency are limited by the magnetomotive force of the winding and by the quality and coupling factor of the resonant circuits. As this is less than 20 kW with an efficiency of about 80% in today's applications for passenger cars, the technical cost is significantly higher than for wired charging. These factors ensure that wireless charging is still a niche solution for now.